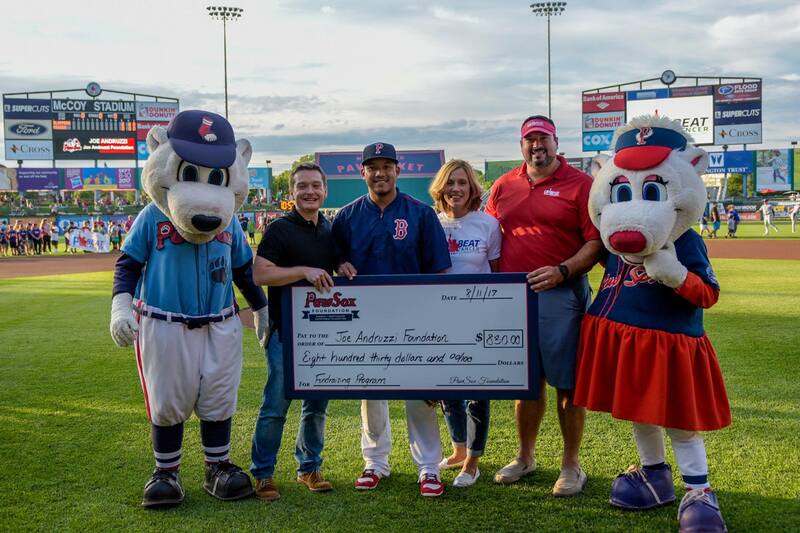 On a perfect summer night, the Pawtucket Red Sox hosted the Foundation and its supporters for a “JAF Night at the Paw Sox” outing at McCoy Stadium in Pawtucket, Rhode Island. For the month leading up to the game, the Paw Sox ran a special promotion where general admission tickets were available to Foundation supporters at a very special rate – just $10! – with $5 of each ticket purchased benefiting JAF’s mission. Over 100 Joe Andruzzi Foundation supporters ended up purchasing tickets through the promotion, and they – along with JAF leadership and staff – had the honor of representing JAF on the field for a special pre-game recognition ceremony. (Joe even got to throw out the first pitch!) We want to send a Grand Slam-sized THANK YOU to the entire Paw Sox organization for hosting JAF, and to the hundreds of JAF supporters who came out for the event.